Having a beautiful smile can help you make a great first impressions and feel self-confident during your everyday life. It may be a great investment towards a career or re-entering a new one. May be you are entering the dating scene or getting married. At Albany Dental Practice we can help you to achieve your goal. Every cosmetic and smile-makeover is unique. Any or a combination of following options can help you achieve the result you are looking for. If you are not happy with color of your teeth whitening your teeth can be a solution to improve appearance. Professional tooth whitening produce better result than over the counter kits. It is always recommended to whiten your teeth before any cosmetic makeover. 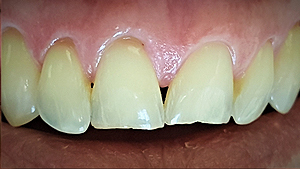 Bonding can fix a small fracture at the corner of the tooth or a small chip. With current advancement in dental material bonding of tooth a predictable solution. Crooked, short, uneven, misshaped or stained teeth can be corrected with Veneers. 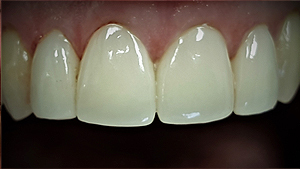 Minimal amount of tooth structure is removed to make room for a thin laminate of porcelain. If the front tooth is badly damaged and can not be repaired with a small filling, bonding or veneer, a porcelain crown is the best option. This is a more permanent and long-term solution to achieve best cosmetic result. Porcelain crown is an excellent replacement on top of an Implant, placed to replace a missing tooth.